An Ahmedabad-based environmental group, Paryavaran Mitra, has alleged that despite "efforts" of the Gujarat to clean up Ahmedabad's highly polluted 20 km city stretch of the 80-km long Kharicut Canal -- constructed by the Britishers more than 100 years ago in order to provide irrigation support to 10,200 hectares in Daskroi taluka of Ahmedabad district and Mahemdavad taluka of Kheda district -- things are unlikely to improve. In a presentation, a copy of which was forwarded to Counterview on the occasion of the World Environment Day, June 5, the environmental group's Mahesh Pandya said, despite two landmark judgments by the High Court, its directions/orders have not being complied with, and there have been blatant violations of law and pollution norms by industrial units in the surrounding areas. Pointing out that the Kharicut canal, which passes through the eastern industrial and densely populated areas, carries sewage and solid waste of the nearby colonies and untreated waste from industries, the environmental NGO said, no doubt, in May 2018, the Ahmedabad Municipal Corporation (AMC) removed 30,000 tons of garbage from the canal, collected over the years, yet there is lack of proper monitoring and cleaning. AMC has installed 104 CCTVs on 53 locations, which has not serve the purpose and didn’t bring much difference, the NGO contended, adding, the root cause of poor condition of Kharicut canal is the poor performance of the AMC. 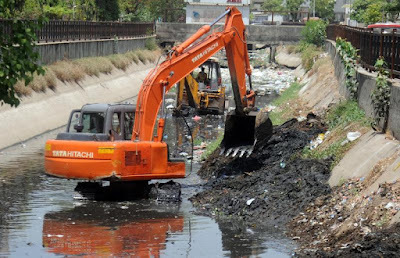 Thus, there is no timely collection of garbage, nor is there any effort to disconnect the illegal drainage lines laid by citizens and industries into the canal, it added. Pointing out that government is giving "airy hopes" that the Kharicut canal would be turned into a six-lane road, the NGO said, way back in August 2010 also the state government decided to cover the canal by planning to invest Rs 65 crore to strengthen the canal lining, even as covering the canal by having eight major parks and gardens atop, but none of this happened. Suggesting that the problem is linked with the way the Gujarat government approaches pollution, the presentation quoted a Comptroller and Auditor General (CAG) report, submitted in 2011, which stated that none of the Central Effluent Treatment Plants (CETPs) discharged treated effluent as per norms of the Gujarat Pollution Control Board (GPCB). The CAG report of 2015 again that observed that CETPs were not adhering to outlet norms in discharging effluents, non-disposal of hazardous waste, leading to the pollution of natural water bodies, into which these effluents were being discharged, polluting the ground water as well as soil of the surrounding areas. The monitoring mechanism of GPCB was ineffective, it added. Then, said the NGO, the CAG report of 2017 said that out of 159, 96 municipalities did not have any proper sewage system, thus solid waste gets accumulated in pits and holes and further spoils crops and contaminates ground water as well as surface water sources. None of the municipalities of the state has technology to purify the contaminated water, it added. The presentation said, the Water Act 1974, Article 24, prohibits discharge of solid waste into the streams, wells and on land. The solid waste should first get purified and then discharged into the main channel. The principles and rules of the GPCB, too, are quite clear about this. In fact, said the NGO, solid waste should be 100% purified before the final discharge, and 20% of that water should get reused. But these norms are never followed.